July 16, 2018: U.S. President Donald Trump and Russian President Vladimir Putin arrive for a press conference after their meeting in Helsinki. 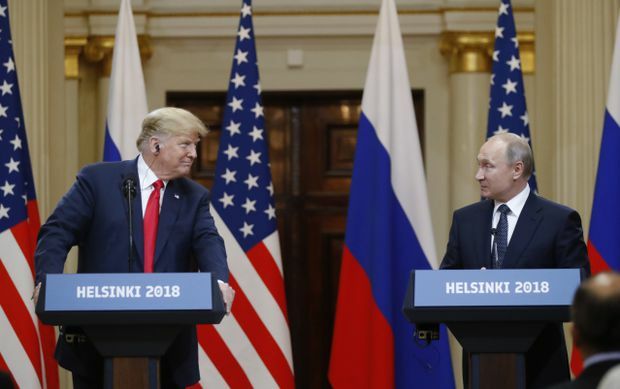 “I don’t see any reason" to believe that Russians hacked the 2016 U.S. election, which American intelligence agencies insist they did, President Donald Trump said Monday after a one-on-one meeting in Helsinki with his Russian counterpart, Vladimir Putin, who continued to deny Moscow’s meddling. During the meeting, Britain's Prime Minister Theresa May – who had been Mr. Trump's host in a U.K. visit last week – rose in Parliament to condemn Russia, saying its leadership was trying to undermine Western values and that its spy service was behind the use of a lethal nerve agent on British soil. She said she "welcomes" the Trump-Putin summit but wants to see Moscow change its ways. What was Trump and Putin’s summit actually about? “The time has come to talk thoroughly about bilateral relations as well as various hot spots in the world,” Russian President Vladimir Putin said Monday ahead of his private meeting with his U.S. counterpart, Donald Trump, in Helsinki. For Russia, those hot spots include Syria, whose years-long civil war evolved into a proxy conflict between Washington, Moscow and their respective Middle Eastern allies; Crimea, whose status as Russian territory Moscow sees as non-negotiable; Ukraine, whose eastern regions have seen years of conflict after pro-Russian rebels waged wars of independence in 2014; and Eastern Europe, which NATO has been working to fortify against future Russian aggression. Russian President Vladimir Putin and U.S. President Donald Trump held their first official summit in Helsinki on July 16. Arms control: Both Russia and U.S. have yet to begin discussions on what to do when New Strategic Arms Reduction Treaty (New Start) expires in 2021. Nuclear proliferation: Mr. Putin praised Mr. Trump for efforts to resolve nuclear tensions with North Korea. “It’s good that the gradual resolution of the problem of the Korean Peninsula has begun," he said. Mr. Putin also said he and Mr. Trump agreed to continue detailed discussions on arms-control issues, and that Russia and the U.S. should discuss a possible extension of the 2010 New START nuclear arms reduction treaty and the implementation of the 1987 Intermediate Nuclear Forces Treaty. For Mr. Putin, sitting down with Mr. Trump offers some more concrete goals. The Russian Prseident wants the U.S. and its allies to lift sanctions, pull back NATO forces deployed near Russia’s borders and restore business as usual with Moscow. In the longer run, he hopes to persuade the U.S. to acknowledge Moscow’s influence over its former Soviet neighbours and, more broadly, recognize Russia as a global player whose interests must be taken into account. But back in the United States, the timing and context of the Trump-Putin summit has taken a more ominous meaning because of the investigation of the Trump campaign’s ties to Russia. Days before the summit, an indictment against 12 members of Russia’s GRU military intelligence service laid out the most detailed explanation yet of how Russian hackers stole data about U.S. voters, illegally accessed Democratic National Convention servers and stole and disseminated documents meant to embarrass Hillary Clinton, Mr. Trump’s rival for the presidency. With midterm elections coming up in November, U.S. intelligence officials are watching closely for more Russian schemes to influence the outcome. 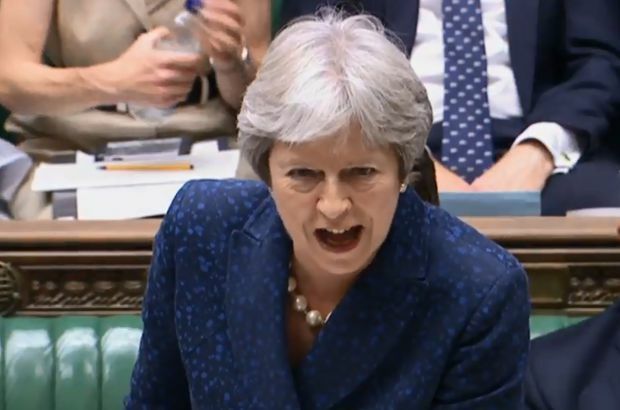 July 9: Britain's Prime Minister Theresa May gives a statement to the House of Commons on Brexit. London - Days before playing host to Mr. Trump, British Prime Minister Theresa May was fighting for her political future in a feud with her cabinet ministers over Brexit strategy. On Sunday and Monday, three ministers quit: First David Davis, who had been in charge of talks to take Britain out of the European Union; then Steve Baker, a junior cabinet minister in the Brexit department; then the biggest of them all, foreign secretary Boris Johnson, who is considered a major rival to Ms. May for the party leadership. Their departures heightened friction between members of the Conservative Party cabinet who want a complete break with the EU and those who want to keep some economic ties, like the customs union. Ottawa - Canadian Prime Minister Justin Trudeau set out from Ottawa for Riga, the Latvian capital. Canadian soldiers are in the country as part of Operation Reassurance, a NATO mission to deter Russian interference in the Baltic region. Canada's Prime Minister Justin Trudeau visits NATO troops at Latvia’s Adazi military base. Latvia - After arriving in Latvia late Monday night, Mr. Trudeau met Tuesday with Prime Minister Maris Kucinskis, then announced that Canada’s NATO commitment in the country would be extended to March, 2023. He also said Canada would increase its deployment from 455 soldiers to 540. Later in the day, Mr. Trudeau met with Latvian President Raimonds Vejonis, visited a military base in Adazi and attended a candlelight vigil at a Latvian memorial to fallen soldiers. Washington - Mr. Trump, preparing to set off for Brussels, fired off a series of tweets accusing NATO members of shirking their responsibilities to pay into the organization and making the U.S. bear the disproportionate cost. July 11, 2018: U.S. President Donald Trump holds a breakfast meeting with NATO Secretary-General Jens Stoltenberg, left, at the military alliance’s summit in Brussels. Brussels - Mr. Trump’s morning in the Belgian capital began with a breakfast meeting with NATO’s Secretary-General Jens Stoltenberg, which got unusually tense when he accused Germany of being in Russia’s thrall. “I have to say, I think it’s very sad when Germany makes a massive oil and gas deal with Russia where we’re supposed to be guarding against Russia,” Mr. Trump said, apparently referring to the Nord Stream 2 pipeline from Russia to Germany’s Baltic coast. “We’re supposed to protect you against Russia but they’re paying billions of dollars to Russia and I think that’s very inappropriate.” Mr. Stoltenberg pushed back, stressing that NATO members have been able to work together despite their differences. Critics fear pipeline would increase Europe’s reliance on Russian gas. Later Wednesday, Mr. Trudeau met Mr. Trump on the summit’s margins for an informal chat about trade, their first face-to-face meeting since June’s G7 summit in Quebec. The conversation was focused on the North American free-trade agreement and the recent election of a new Mexican president, a spokeswoman for Mr. Trudeau said. Brussels - Mr. Trump’s second day at the NATO summit featured similar rhetoric to the first. In a series of tweets, he singled out Germany, the second-biggest contributor to NATO’s common budget, saying it and other wealthy nations needed to pay more. But France’s President Emmanuel Macron disputed whether Mr. Trump talked as tough as he says he did. “President Trump never at any moment, either in public or in private, threatened to withdraw from NATO,” Mr. Macron said at a news conference. Mr. Macron also disputed Mr. Trump’s claim that NATO allies have agreed to boost defence spending beyond 2 per cent of GDP. Mr. Trudeau, for his part, said Canada was already working toward increasing its military spending through a 10-year plan announced in June, 2017. President Donald Trump, lower right, leans back to talk to other NATO leaders at a group photo in Brussels. 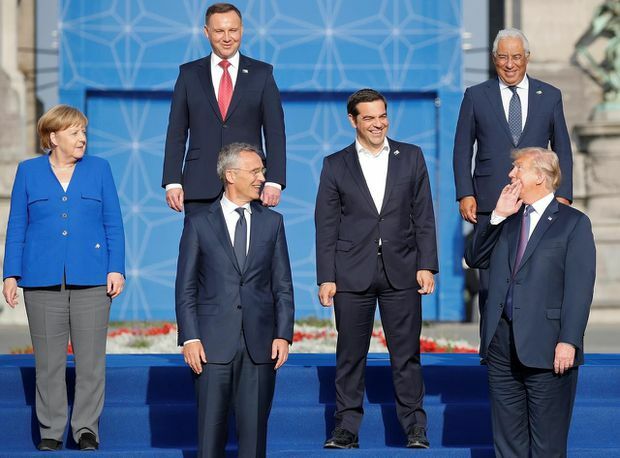 From left are German Chancellor Angela Merkel, Polish President Andrzeji Duda, NATO Secretary-General Jens Stoltenberg, Greek Prime Minister Alexis Tsipras and Portuguese Prime Minister Antonio Costa. He accused Ms. May of ruining her country's Brexit plan, saying her version of separation from the EU "is a much different deal than the one the people voted on” in the 2016 Brexit referendum. He blamed recent terrorist attacks in London on Mayor Sadiq Khan, who is a Muslim. The president claimed Europe is “losing its culture” because of immigration from the Middle East and Africa. A helicopter leaves the grounds of the U.S. ambassador’s residence in Regent's Park, London. 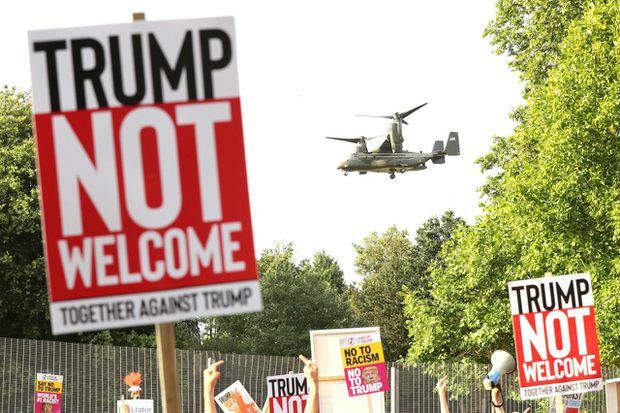 Britons vented anger at Mr. Trump at his helicopter flight on Marine One leaving from the ambassador’s residence. Demonstrators jeered and banged pots and pans, and another group of protesters lined roads near the palace. Some of their signs read “Dump Trump,” ”Lock Him Up” and “There Will Be Hell Toupee.” Police worked overtime, their days off cancelled. The U.S. President’s first official function in Britain was an evening reception at Blenheim Palace, birthplace of Winston Churchill. The outdoor arrival ceremony at Blenheim — Mr. Trump wore a tuxedo and first lady Melania Trump a butter-yellow, chiffon, off-the-shoulder gown — was a grand affair marked by a military band in bearskin hats, hundreds of business leaders in black tie and gorgeous setting sunlight. 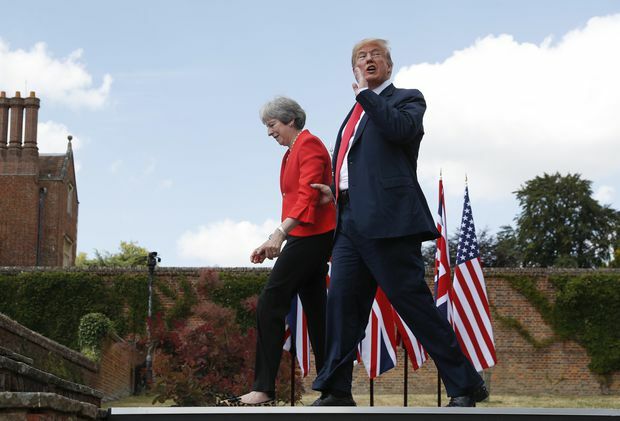 July 13: Mr. Trump responds to a reporter's shouted questions as he walks with Ms. May at Chequers, in Buckinghamshire. London - After lambasting his British host the day before, Mr. Trump started his Friday with Ms. May, watching a military demonstration at the Royal Military Academy Sandhurst. The event was closed to the media. 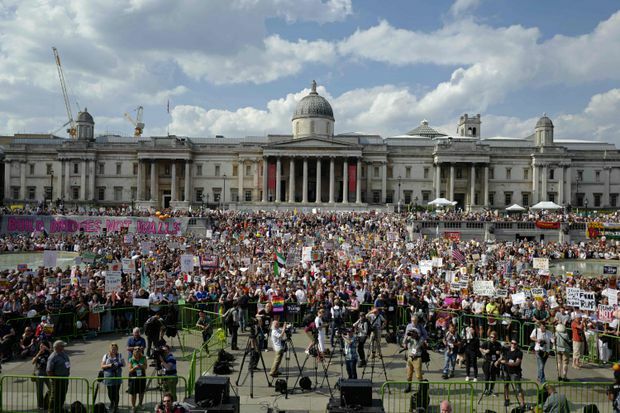 In London and dozens of other cities across Britain, protesters rallied to speak out against the President’s visit. Hundreds crowded in Parliament Square under a balloon depicting Mr. Trump as a screaming baby. Some 16 balloon minders in yellow vests identifying themselves as “babysitters” minded lead lines to the balloon as the curious gawked and took pictures. 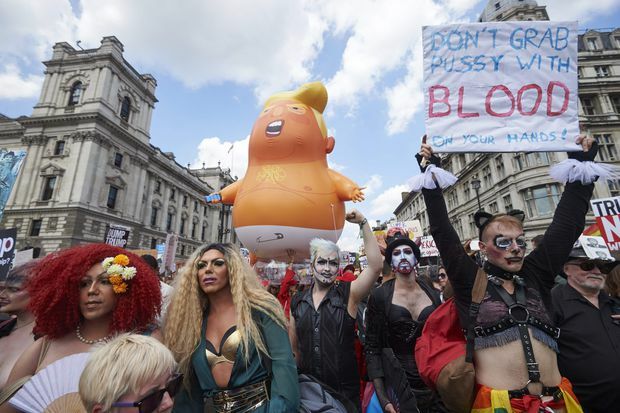 London: Drag queens and protesters take part in a rally. Trafalgar Square is filled with protesters holding up placards. Washington - Around the time Mr. Trump went to Windsor Castle to meet the Queen, an announcement back in Washington cast a shadow over the upcoming Helsinki summit: The Justice Department announced indictments against 12 Russian military intelligence officers, charging them with hacking the computer networks of Democratic candidate Hillary Clinton in 2016. Deputy Attorney-General Rod Rosenstein said he briefed Mr. Trump earlier in the week about the indictment. Hours before the announcement, Mr. Trump described the investigation by special counsel Robert Mueller as a “rigged witch hunt,” saying it was hurting the U.S.-Russian relationship. 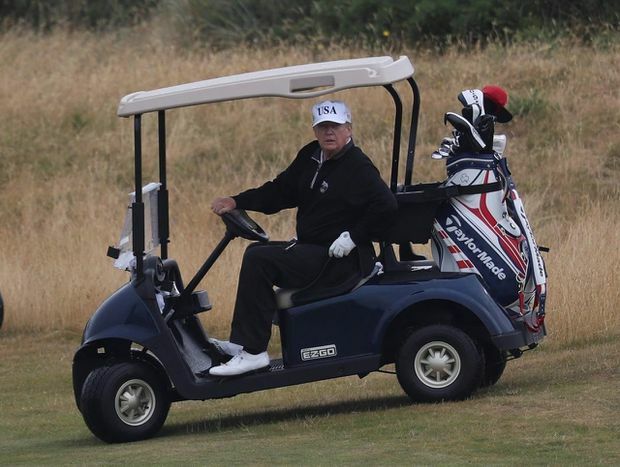 July 15: Mr. Trump drives a golf buggy on his golf course in Turnberry, Scotland. Scotland - Mr. Trump spent the weekend at the Turnberry resort in Scotland, his mother’s homeland. Dozens of protesters rallied outside his resorts on Saturday, while thousands marched through the capital of Edinburgh in opposition. Helsinki - Mr. Trump arrived in the Finnish capital late Sunday from Scotland. Several dozen supporters, many waving American flags and sporting “Make America Great Again” caps, cheered him as he neared the posh waterfront hotel where he was staying. Several were from the True Finn anti-immigration party, and said they wanted to make a show of support in a country where many people have criticized his policies. July 16: Mr. Trump Russia's President Vladimir Putin shake hands as they meet in Helsinki. Helsinki - Mr. Trump started his day with some eyebrow-raising tweets about the NATO summit (he said NATO leaders called him “thanking me for helping to bring them together”), Mr. Mueller’s investigation (which he again called a “Rigged Witch Hunt”) and U.S.-Russian relations (which he said had “NEVER been worse thanks to many years of U.S. foolishness and stupidity and now, the Rigged Witch Hunt!”). Later in the morning, he and Ms. Trump met Finnish President President Sauli Niinistö at Helsinki’s Mäntyniemi Residence, where Mr. Putin was due to arrive for the one-on-one talks. They would have to wait for him a while longer than planned: Mr. Putin, who is habitually tardy in meetings with world leaders, arrived in Helsinki 30 minutes late. Once the leaders were finally together, they shook hands in a room of the palace adorned by U.S. and Russian flags. Their private meeting in the palace’s Gothic Hall, originally scheduled for 90 minutes, went on for more than two hours before the two joined their top advisers for a luncheon. United States - Mr. Trump’s defence of Russia was met with shock and disappointment by politicians of both parties. “There is no moral equivalence between the United States and Russia, which remains hostile to our most basic values and ideals,” Republican House Leader Paul Ryan said. Chuck Schumer, the Democrats’ minority leader in the Senate, challenged Republicans to confront the President directly by increasing sanctions on Russia and requesting testimony about the summit from administration officials. “We need our Republican colleagues to stand up for the good of this country,” he said. How it started: NATO is a military alliance forged in the years after the Second World War, amid fears that the postwar Soviet Union would move the Iron Curtain further into Europe. Canada, the United States and nine European nations were NATO’s founding members, while the USSR set up a rival defence alliance called the Warsaw Pact. After the Soviet Union collapsed, NATO’s membership grew considerably, and it now has 29 member states. ization (NATO) after the demise of the USSR in 1989.
demise of the USSR in 1989. Tensions with Russia: In 2014, tensions between NATO and Moscow reached a new post-Cold War high because of a Russian-backed separatist uprising in eastern Ukraine, followed by the annexation of Crimea from Ukraine. Western nations saw the pattern of Russian expansionism extending to regions of Georgia, and potentially the Baltic states of Lithuania, Latvia and Estonia. NATO began a mission to defend those countries called Operation Reassurance, which Canadian troops are still a part of. Tensions with Trump: When NATO’s conflict with Russia first escalated, then U.S. president Barack Obama was strongly critical of his Russian counterpart’s expansionist aims. But during and shortly after the 2016 U.S. election, Donald Trump was more dismissive of NATO: He said the alliance was “obsolete,” accused other NATO members of not paying their fair share and suggested that renewing ties with Russia was a good idea. He walked back the “obsolete” comment in 2017, and his administration tried to tread lightly on the Russia file amid investigations of Moscow’s ties to the Trump presidential campaign. But last month, Mr. Trump disrupted the first day of the Group of Seven summit in Quebec by suggesting that Russia should be readmitted. Soon after, Washington and Moscow struck a deal to bring Mr. Trump and Mr. Putin together for talks in Helsinki on July 16. What Mr. Trump will say in Brussels about Russia is anyone’s guess, but it has the potential to sow further division in the group. Tensions over money: Mr. Trump’s criticism of NATO has also centred on money. Member countries agreed in 2014 to spend 2 per cent of their GDP on defence within a decade. The U.S. far exceeds that target, but most countries haven’t met it yet, and Canada is near the bottom of the list in terms of spending by GDP. Last summer, Defence Minister Harjit Sajjan announced a $62.3-billion, 20-year spending plan that would raise defence spending to 1.4 per cent of GDP by 2024-25. In recent months, Mr. Trump has escalated criticism of NATO allies, and has repeated some misconceptions about how NATO funding works, falsely suggesting that the nations with smaller defence budgets owe the U.S. money. There is no such debt to the U.S. or to NATO: The 2-per-cent target is not a “commitment,” not a direct contribution to NATO, not a payment owed to the U.S., and not something that alliance members pledged to achieve immediately. The 2-per-cent target is separate from NATO‘s common budget, contributions to which are decided based on the size of the member nation’s economy. The United States makes up about 22.1 per cent of the common funding. Lawrence Martin: Whose team are you playing for, Mr. Trump?